Cost effective and price sensitive to all clients large or small. An environmentally conscious company which supports recycling. Ask how we can help you with our green cleaning. A great team of professionals to outsource your cleaning requirements. 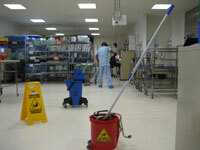 MediClean offers a full range of medical cleaning services within clinical and surgical areas. With emphasis on responsible cleaning procedures towards our environment and accountability of services, MediClean can clean your theatres, clinical areas, medical suits, administration areas and even your kitchens, carparks and plant rooms. MediClean has uniformed its audits sheets to comply with the Victorian Health Department's standard audit sheet and scoring schedule. All our medical facilities are now being audited with the new format which will assist in benchmarking and comparison of standards.